Heavy products in fine or limp hair can cause it to look dirty and greasy, even if you've just washed your hair. Not all products are ideal for your hair type, and using too much of waxes, pomades or other styling products can weigh your hair down and make it unmanageable and oily. If you already suffer from limp, thin or oily hair, it's important to choose hair products that don't leave your hair greasy for the best results and for hair that looks healthy and shiny. Start on the right foot by using a clarifying shampoo once or twice a week. The buildup of greasy and heavy products can make your hair look dingy, even if you've washed them out. A clarifying shampoo can strip your hair and leave it feeling clean and light. It's important to remember that clarifying shampoo is not ideal for daily use; it can be too harsh on hair. Instead, use it as a way to start afresh for cleaner and lighter hair without all of the greasy products you've used in the past. The Beauty Brains website recommends shampoos that contain sulfates to strip the hair of grease and oil, but remember to follow up with a conditioner to hydrate hair. Before you begin your typical styling routine, add a mousse to your hair instead of your usual serum or pomade. Both serums and pomades are oil- or glycerin-based, making them heavy on the hair. Mousse is typically alcohol-based, with other ingredients like natural oils and silicon to help your look shiny and healthy, according to HairBoutique.com. A golfball-sized dollop of hair mousse can give you the hold, volume and definition that you want without weighing your hair down or causing it to look heavy or greasy. Hairspray is usually the finishing touch for most hairstyles, providing hold and definition. Because it is alcohol based, it won't make hair look greasy or oily. In fact, it will likely cause the opposite, drying out your strands. 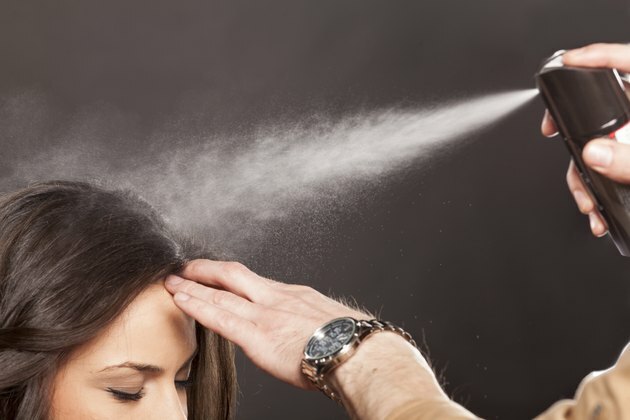 Because of this, it's important to use hairspray sparingly so as not to dry out your hair and overstimulate the sebaceous glands on your scalp to create even more oil. Though it can be drying, hairspray is still far preferable to other products that offer long-lasting hold, like gel, wax or pomade. When you don't have time to wash your hair, you might be tempted to use hair products to slick it back into a less obvious style, but adding more products to already greasy hair will only serve to make it look dirtier. Using too many products, especially those that leave your hair feeling oily or waxy can only exacerbate the problem. Dry shampoo can be used in place of a variety of products. Its main ingredient is cornstarch or talc, which clings to the hair and absorbs oil. It gives your hair added fullness and makes it easier to manage until you have the time to wash your hair.